Scenes in Gotham City were filmed on the streets of Chicago. It works at so many levels. I cannot bear to compare Blago to Heath Ledger. 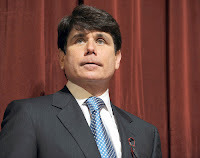 I think Blago plays Harvey Dent...young, pretty boy turned two-faced by politics and greed. He seemed pretty two-faced when he when he called our president-elect and mother-trucker. Would bribe-seeking be appropriate as CEO of a private business, though? I think there's something seriously wrong with the guy.